1/2 cup butter, room temp. 1 cup sugar 2 eggs 1/2 cup buttermilk 2 Tablespoons fresh squeezed lemon juice 2 teaspoons grated lemon rind 2 cups flour 2 teaspoons baking powder 2 cups fresh blueberries (I used 1 cup) Cream butter and sugar. Add one egg at a time, mixing well after each. Add buttermilk, lemon juice and lemon rind. Gently stir in dry ingredients just until moistened. Fold in blueberries. Divide batter into 10 or 11 greased muffin tins. Each tin should be filled to the top edge of the muffin tin. Bake 400 degrees for 25 to 30 minutes until done. Cool 5 minutes and then remove to cooling rack. Lemon Icing 3/4 cup powdered sugar 1 tablespoon fresh squeezed lemon juice 1/2 teaspoon melted butter 1/8 teaspoon vanilla Mix until well blended. 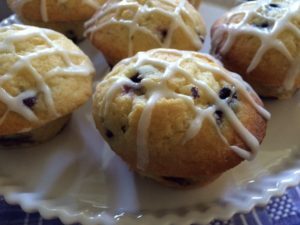 Drizzle over warm muffins. Once completely cooled store in the refrigerator until ready to serve. Warm slightly in microwave before serving.